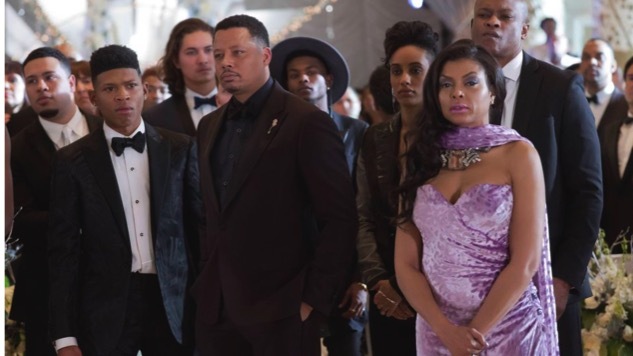 At this point, with Empire finishing up a rollercoaster ride of a second season, it’s not a question of whether or not they’ll be piling more drama and craziness on to each episode. We’re really just waiting to see how high they’re willing to stack it up. For this season finale, the writers kept piling it on and… well, it couldn’t help but topple over. It had something to do with the mood of the episode. It felt almost disconnected from the rest of the season, with very little music to speak of and a tone that was bordering on the histrionic. Taraji P. Henson had, up to this point, been all fire and fury, even showing a little tenderness to her nemesis Anika to get her to not jump off a building. But there at the end, she threw out the tear-stained bluster that felt like she was straining for something she just couldn’t reach. Too, for all the growth that Bryshere Gray has exhibited throughout, watching him weakly plea for his fiancee to reconsider was agonizing in all the wrong ways. The fight of the century exploded in this episode, starting with Rhonda cold-cocking Anika after she finally put it together that her father-in-law’s ex pushed her down the stairs and killed off her unborn child. Give some credit to ol’ Anika though, even at about seven months pregnant, she still held her own in the scuffle that closed out the hour. She may have even tossed that Becky with the good hair to her death. We’re not going to know until Season Three comes rolling around later this year. Place your bets now as to who survived. That’s some kind of Hail Mary pass from the brain of Lucious Lyon and his betrothed to get them married so Anika can’t testify against him in court. Pretty sneaky, sis. At the altar they looked like Benjamin and Elaine at the end of The Graduate: shellshocked and wondering just what in the hell they’ve gotten themselves into. And leave it to Jamal to state what we’re all thinking: Lucious is going to be both father and grandfather to Anika and Hakeem’s spawn? That’s messed up right there. Just how many more big reveals can one show handle? At this point, only two more—with Lucious’s mom spilling the beans that her son watched his father die in the line of duty, and that Tariq, the handsome FBI agent working the case against Empire is actually (dun..dun…dunnnnnnn) Lucious’s half-brother. To use another Dustin Hoffman movie reference, it was as garish as Michael Dorsey whipping off the wig at the end of Tootsie. Does this mean that the writers for Empire are moving past Hamlet and into Richard III territory? My kingdom for a little sanity in the next season, people. Now here’s some genius casting on the part of Empire: bringing in Xzibit to play one of Lucious’s hip-hop rivals and someone who could cause trouble for the company in court. He was loving every minute of it, too. The scene where he burst into the wedding ceremony with about six hoes in tow was the best moment in this episode. I really hope there’s about 20 more minutes of unused footage from that day of filming lying around and waiting to be added to the DVD release. I could watch Xzibit make that stroll for hours. Or watch him throw another hissyfit about getting his Twizzlers. I’ll be spending a lot of the time between seasons of Empire wondering what in the hell that sparkly hair net thing was doing on top of Veronika Bozeman’s head, and wondering where Thirsty found himself that clown tie he was sporting during the wedding. You know the show is trying to push a fashion agenda, but I wish they’d leave that to Cookie’s sartorial choices and let the other characters be. And if I start seeing dudes out there wearing these outrageously huge bow ties and women with weighty baubles all over their heads, Empire’s going to have a lot to answer for.